Our last review of Driver Sweeper dates back to March where we reviewed version 1.5.5 of the system software (read: Device Driver Cleanup). It can be used to uninstall drivers completely from the operating system, something that is sometimes useful if the old driver is causing issues on the system. While you may be able to install the new driver over the old, or use Windows' own tool to remove the old driver, it is often better to start with a clean slate. Some drivers, Nvidia's video card driver for instance, support the complete removal of the old driver prior to installation of the new. Most driver installers don't however. The developer has been busy in the past months releasing several new versions of the system driver uninstaller. Driver Sweeper 2.1 was released yesterday by the developer. The interface itself was revamped a bit but has not changed a lot otherwise. Driver Sweeper offers the functionality to remove specific system drivers from a Windows operating system. The supported drivers that can be removed are from Ati, Nvidia, Creative, Microsoft and Realtek. The user can select one or multiple of the supported manufacturers in the main menu. A click on the Analyse button starts the system scan which results in a display of all files, folders and Registry entries related to the selected drivers. All or only some of these items can then be cleaned from the computer system. The main intention of Driver Sweeper is to act as a driver cleanup after the official driver uninstallation. It can also be handy if a driver cannot be uninstalled with the provided uninstaller by the driver manufacturer. Driver Sweeper 2.1 comes with improved cleaning algorithms and full Windows 7 support. This version (actually version 2.0) has been rewritten from scratch. It does require the Microsoft .net Framework 3.0 now to be installed before it can be installed or executed. Interested users can download the latest version of Driver Sweeper at the developer's website. Update: Please note that Driver Sweeper has been discontinued. Part of the program's functionality has been integrated into Driver Fusion, a program serving the same purpose. Driver Fusion is available as a free and premium version from the developer website. 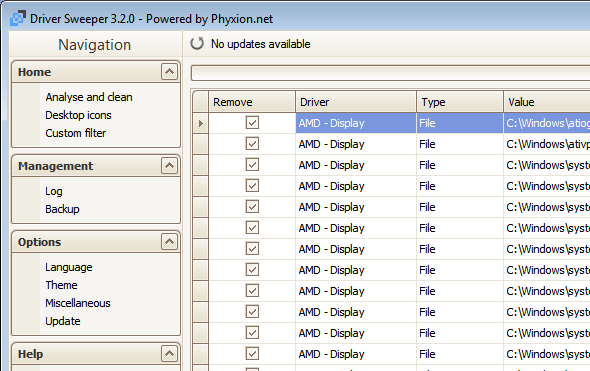 The free version of Driver Fusion supports the removal of system drivers from the Windows PC. It supports the saving of the desktop resolution and desktop layout, so that it can be restored at a later point in time. Took me time to read all the comments, but I really enjoyed the article. It proved to be Very helpful to me and I am sure to all the commenters here! Its always nice when you can not only be informed, but also entertained! Im sure you had fun writing this article.